There has been another suspicious fire at Turin's Cathedral and an incinerated body discovered: a body of a man without a tongue, but this is not the first. Marco Valoni the head of the Italian Art Crimes Department has been sent to investigate. He is sure the mysterious fires are related to the famous Shroud of Turin, but how and why? 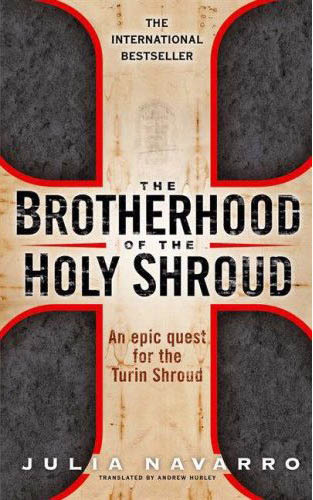 I came to this book with an existing knowledge of and interest in "The Shroud of Turin". I wanted to see how the author was going to handle the subject. The answer was very much like Dan Brown handled "The Holy Grail" in THE DA VINCI CODE. This includes the Knights Templar, strange, obsessive monks and a complete lack of any finesse, literate or otherwise. My first impression was that the characters were one dimensional. I thought initially that this may have been because of instead of following just one detective investigating the case, we are asked to follow a whole team. This could have been interesting, but very quickly became unwieldy. Soon I was trying to track The Arts Crime Department, Europol, The CIA, the sister of the Europol agent who was also a journalist and various other friends and family. This whilst following another, parallel story line dealing with the alleged history of the shroud with an equal number of bland characters. All conversations were described as 'animated', the dialogue was often ridiculous, there was no regard for any possibility of police procedure and it was quite evident that the author had done very little research. At one point whilst backtracking through the book to confirm the identity of one of the characters I thought to myself, "why am I bothering with this?" Indeed.